River Valley and South Gallia women’s basketball teams made the trip to the NCAA Women’s Final Four in Columbus this weekend. 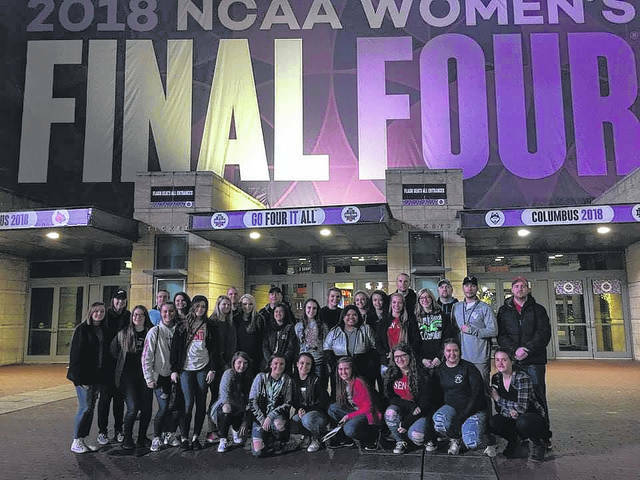 COLUMBUS — South Gallia and River Valley students made a special trip to Columbus Friday evening for the NCAA Women’s Basketball tournament final game. Both teams made the trip to witness the occasion, a first time for the city of Columbus as well. Both the lady Rebels and Raiders were able to go to the final four, an exercise in team building and witnessing players at the next level of the game. Erin Evans, a South Gallia Senior, is grateful for the experience. The final four hosted all four number one seeds from the tournament, with two overtime games making for an exciting night of basketball. One River Valley junior would do it all over again to see the final four. River Valley’s women’s basketball coach Stephen Roderick explained the benefits of this trip for his players. According to Roderick, the sheer awe and the environment they were in fostered team bonding and an appreciation of the game and hard work. When regarding the event as a whole and the benefit to students, South Gallia Coach Corey Small explained how important the night was. “Getting the opportunity to go to the Women’s Final Four is a once in a lifetime experience for these girls, myself, and the rest of this coaching staff. Not only did we have the privilege of watching two great games, but we met Hall of Famer Katie Smith who allowed us to chat and take plenty of pictures. Moments like these are what make you proud not only to be a Rebel, but a member of Gallia County Local Schools,” said Small. As far as the games themselves went, there was plenty of action. According to some of those who witnessed the game in person, it was arguably the best women’s final four of all time. Despite the action on the court, the Raiders and Rebels are eager to get back onto the courts themselves.